I'm using yesterdays sketch as my jumping point, but changing a few elements for the card I've created. 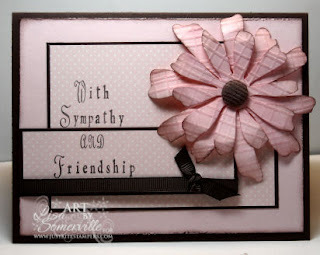 I've had the Flowers #2 Die and Texture Plates for quite sometime, and pulled them out for today's card. When I cut my flowers from my Pink Pirouette card stock, I thought they were too plain, so I ran them through my Big Shot using my Texture Plates, then added some highlights to the raised area using Pink Pirouette and Chocolate Chip Inks. For the center of my Flower I used the new Corduroy Buttons from Stampin' Up! - I think they add some great texture. To add a bit more dimension to the flower, I curled the edges by wrapping them around a pencil lightly, then adhered to my card with a Pop Up Glue Dot. To create my custom sentiment I used the new JustRite Vertical Block and Lowercase Times New Roman Font that will be introduced at CHA. I also used the Just Rite Special Occasion Paper Crafting Font Ensemble in 25 and 50 point. I used my Stamp-a-ma-jig to get proper placement of my sentiment on my panel., stamping directly on my layered images in Chocolate Chip ink. Beautiful colors and terrific design Lisa! Lisa, this is gorgeous, the flowers are perfect and I love the sentiment! ooooh! This is sooooo preeeeeetty! Fabiliscious job on the flowers! those are very pretty! You do really nice work.